Yvonne Conte, author of the new book “Cry, Laugh, Cook! : A Collection of Essays, Conversations, and Conte Family Recipes” (published by Balboa Press), describes herself as a laughter, humor and joy expert. Coming from a long line of “laughter, humor and joy experts,” Conte often credits her expertise to her family. An award-winning sales executive and popular public speaker, Conte distills her family’s lessons in cooking and homemaking to deliver a clever collection of essay on the art of living well. 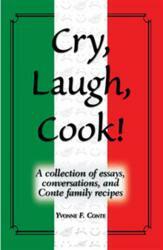 “Cry, Laugh, Cook!” is divided into three sections: a collection of essays, conversations with Gary Dunes, a long time fixture in the Central New York radio market, and 45 authentic Italian recipes. Yvonne Conte is a former award-winning sales executive. She has spent the past 22 years studying the benefits of humor, laughter and joy. Today she helps Fortune 500 companies create a positive corporate climate where laughter and humor is encouraged. Her clients include Xerox, Time Warner, AT&T, G E Global and Merck Pharmaceutical. Her first book [“Serious Laughter” sold over 50,000 copies, is printed in two languages and is used in colleges to teach students how to think funny. Her first printing of “Cry, Laugh Cook!” has received rave reviews. Conte is the recipient of the Syracuse Women in Leadership Award and is an internationally recognized Stress Management Consultant, Corporate Culture Expert and Motivational Humorist who has been lecturing and writing for over 22 years on the subject of turning emotions into positive action, productivity, laughter and joy.